Prize winners last year at the Cops & Bobbers fishing tournament. 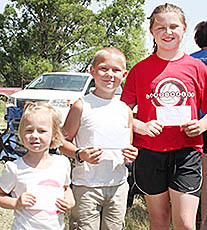 Youngsters who want to fish are welcome to take part in the second annual Boone County Cops & Bobbers Fishing Contest scheduled this Saturday, June 10, at Dave Schrad’s Lake west of Petersburg. The route will be marked. Fishing will be from 10 a.m. to 12 noon, followed by a lunch sponsored by area grocery stores. Prizes will be awarded to each participant, and those who registered by May 26 receive a T-shirt. Proceeds will be donated this year to the Farm 4 A Cure organization.